Prior to 2016, I’d never noticed Henri being especially fearful of fireworks. I mean, he didn’t like them- what dog does? !- but he wasn’t traumatized. It was that year, on the 4th of July that I came home from a cookout to discover a trembling, fearful, hot mess of a dog. We were living in a 1940s style bungalow with about zero noise insulation and our neighborhood had become a war zone. We slept on the kitchen floor that night-Henri seemed to think it was the safest place- and I promised him he’d never have to do that again. By the time explosion season came the next year, we had fancy noise-canceling headphones, calming treats (we use these), and the pinky-paw swear that I wouldn’t make him stay home alone. The headphones worked great once he realized what they did, the calming treats have been used since, and Henri survived another year. Of course, I missed out on some pretty cool fireworks shows and I’ve still got several large boxes of unexploded Saturn Missles, but we do what we can for our pets. This year I had the genius idea that we should get away. As I’ve already mentioned, I live in a residential area turned holiday battlefield. It’s fairly ridiculous, as it goes on for days, but the worst of it is on the 4th and the weekend nights preceding and following. I live in the South. Any excuse to blow stuff up for ONE day is an excuse to continue for several. Far be it from us to waste ammo (sips sweet tea for emphasis). Why were we staying here?! To test my get away theory, I decided to book a room at a hotel in a non-residential area. Surely, it would be quieter. Then it occurred to me that I might be able to get a room overlooking some distant display. Could I enjoy fireworks without Henri having to endure the sounds? I called our local Aloft for a chat. Lucky for me their marketing director has a Jack Russell Terrier who is also afraid of noise. She was more than happy to help me with my special request. I say ‘special request’ because Aloft typically makes every effort to put canine guests in first floor rooms for ease of potty duties. 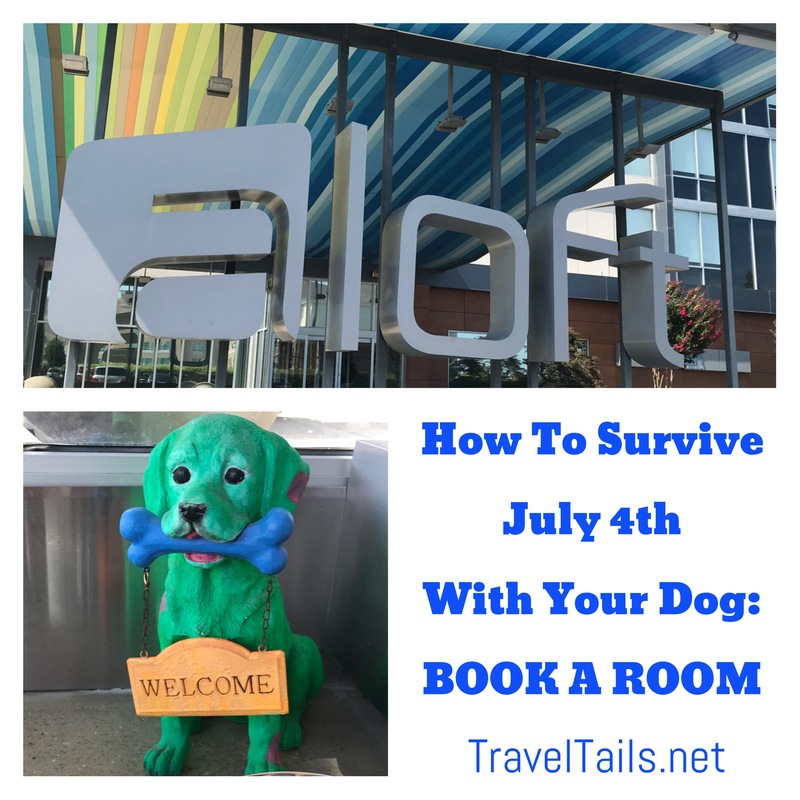 Their ARF program makes sure the pooches have great amenities (though sometimes you do have to ask), and many of the hotels, including Aloft Rogers-Bentonville, have a ‘pet wing’ on the first floor with direct access to outside. We received a discounted room on the 6th floor of the hotel overlooking one of Northwest Arkansas’ biggest displays. A 20-plus minute fiery explosion was going to go off less than half a mile from our window. I took Henri’s headphones and calming treats just in case. When the first boom announced the start of the show, Henri’s ears went back. I gave him a scratch and acted like it was no big deal. He wasn’t quite sure what to do, but after a few more shots, he settled himself under the desk. I offered him some comforting words and plopped myself onto the bed. When it became obvious that death was not eminent, he decided to join me. Though he turned his head and curled up next to me in such a way as to pretend they weren’t there, he could definitely hear and see them. Fortunately, the insulation of our room and the noise from the TV on the wall, provided just the right amount of dampening of both sight and sound. Our experiment was a success and if things get too bad in the ‘hood, we may head back to the hotel. Since we can’t all pack up and head to the nearest hotel, I’m providing you with a list of my best suggestions for dealing with dog anxiety. In my experience as a trainer, I have found that it is typically a combination of things that helps the most. If I have personally used or have confidence in a specific suggested product or method, there’s a link. However, I do want to offer this one precaution: if your dog is really unhinged and you suspect he might be a danger to himself or someone else, like a flight or bite risk, call your vet. Get real drugs and save the experiments for later. DogTV. Yes, DogTV. I bought a subscription just to see what it was and it’s kinda cool. Henri will lay on the end of the bed and watch it intermittently. Now might be a good time to sign up for a free trial. ThunderShirt or anxiety wrap. If fireworks are going off in your neighborhood as you’re reading this, it may be a little late for you to run out and purchase a ThunderShirt, or they may be sold out. If you’ve got an ace bandage, try the anxiety wrap. You could also try a t-shirt, if your dog wears them, or an old t-shirt of yours if you can make it fit snuggly. This is like swaddling a baby, so you do want a snug, but not too tight, fit. Calming treats (lots of good ones on the market), CDB Oil/treats, Rescue Remedy. A distracting toy or chew. Stuff a Kong with peanut butter and freeze it (it’ll last longer). Visit your butcher for a genuine marrow bone. Try a puzzle or treat dispensing toy. Exercise! Take your dog for a long walk, hike, or swim before dusk. Exercise releases endorphins. If there is something you’ve tried that works and I haven’t mentioned it, please SHARE in the comments. You might help somebody.